The artist Anja Knecht now lives in Berlin and Switzerland after having explored part of the world during studies abroad: France, Italy, Asia (China, Japan) and others are among her stops and exhibition locations. Now, she stands in her Berlin atelier shaking her head impatiently as I interrupt her during her passionate explanations…with utmost precision, she elaborates on technical details of photography only to suddenly pirouette into reciting an Italian poem by Sandro Penna ("Rimbaud of Italy", Pier Paolo Pasolini) that for her, wonderfully expresses the mood of her photo projects: Scarcity and the absence of psychological embellishments. Technical versatility and trusting in the right moment, playful deployment of the exact mediums epresent the strengths of Anja Knecht. Her compositions merge into chromatic progressions to spaces bedazzled in light and colour, virtually monochrome minimalist compositions. Some objects, yearning to be unlocked, lead the viewer around by the nose, leave room for (or room to play) interpretations such as the series "Rejeté Rejeton". This play with our sense of sight, with our perception, is created - that much may be revealed - in drawing on an old photographic technique of the photographic pioneer Henry Fox Talbot, who experimented in the early 19th century with photographic paper, developer, and lux, light. Experiments with light, one could also describe Anja Knecht's works as such. The Triptych "Pré-Salé", originated on the beach of Normandie, to us, it first appears as a blurred photograph of the sea. Then one notices that the light in the middle is different, brighter, glistening like moonlight though the three parts nonetheless clearly depict a uniform expanse of landscape. The dimension of time has entered and found an expression. Long exposure times often conjured these blurred spaces abounding with depth. The light accumulates, gathers intensity. The series "The Pencil of Nature" primarily deals with this idea letting things happen. I let the surroundings define themselves, the artist comments on her method and distinctly refers to Talbot with this title, who introduced his ground-breaking book on photography bearing the same title. The motion picture accompanied with sound: With the medium video, Anja Knecht discovered another of her suitable artistic means of expression, which she enjoys presenting in a spatial context such that through the interplay with the architectural instances, an installation with its own characteristic nature emerges. The video "Loverbeads" in turn provides psychological space and has plenty of allusions in store, which revolve around the themes of love, jewellery/luxury, authenticity/deception, and eroticism. 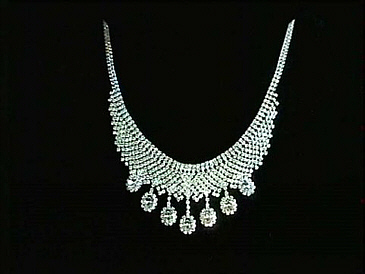 A large diamond necklace moves up and down and the video leaves it to the imagination of the viewer to envision the wearer; the feminine bosom, rising and falling, and the audible dialogue from the film classic "To Catch a Thief" triggers summons further emotions and associations. A jewel serves as a symbol for an entire world. Whether the viewer is familiar with the film, understands the English dialogue or not: The sound of the voices and the suggestive puissance of the necklace are enough to take him/her to this other world: "Even in this light, I can tell where your eyes are looking at!" Bildende Künstlerin im multimedialen Bereich: Fotografie, Video, Klang, Performance, Arbeiten im urbanen Raum/Kunst-am-Bau-Projekte. Galerie Rantapajan, Lappeenranta, Finnland u.a.